An extreme heatwave in Australia has led to the deaths of more than 90 wild horses in the outback, authorities say. Rangers found dead and dying animals in a dried-up waterhole near Alice Springs, in the Northern Territory, last week. 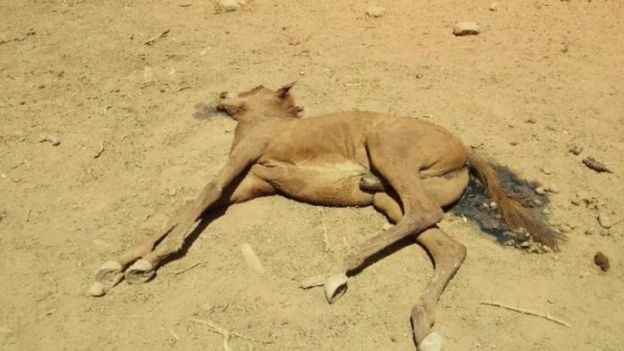 About 40 of the animals had already died from dehydration and starvation. Surviving horses were later culled. On Thursday, the city of Adelaide experienced its hottest ever temperature – 46.2C (115F) – eclipsing a record set in 1939. How were the horses found? Rangers came across the horses after their absence was noted by a remote community, said local authority Central Land Council (CLC). A local resident, Ralph Turner, also visited the site and posted photos online, describing the scene as “carnage”. “I was devastated. I’d never seen anything like it – all the bodies,” he told the BBC. Another local, Rohan Smyth, told the ABC that water was “normally there” and that the horses “just had nowhere to go”. The council said it had organised a cull of the remaining horses because they were found close to death. 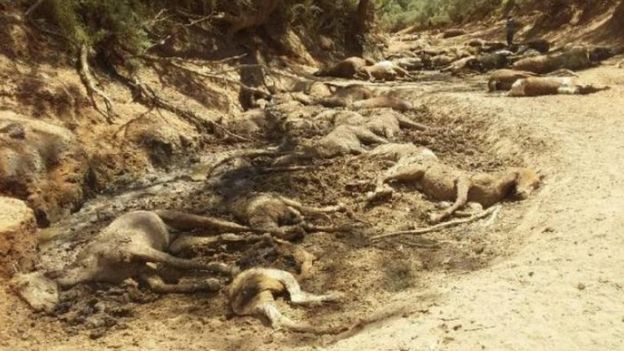 They also planned to cull another 120 feral horses, donkeys and camels “dying from thirst” in a neighbouring community, said CLC director David Ross. The extreme weather follows a record-breaking heatwave that produced five of Australia’s 10 warmest days on record. Authorities issued health warnings urging people to stay indoors and minimise physical activity, with heightened concerns for the elderly, the chronically ill and children. Several other wildlife species have also suffered, including reports of mass deaths of native bats in New South Wales. Up to a million fish have also been found dead along river banks in the drought-affected state.